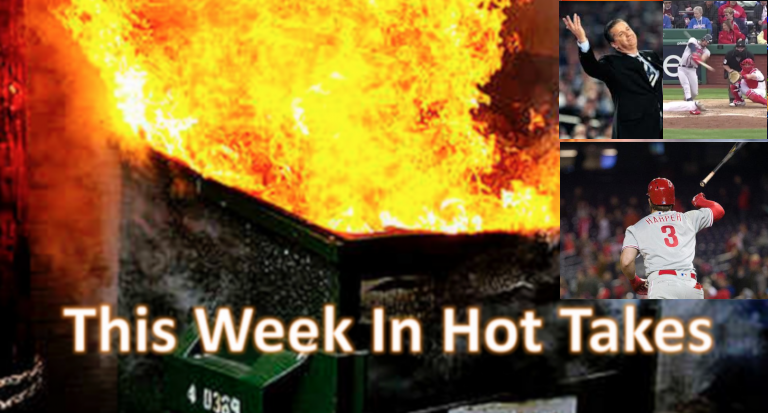 This Week In Hot Takes: Jonathan Allen rants about Bryce Harper's "grotesque behavior"
"Harper hit .211 in 19 post-season games, striking out 23 times in 76 at-bats and compiling an .801 OPS. He was often on the DL, from which he tweet-praised a pitcher who was no-hitting Nats. His grotesque behavior on the field was worse than what goes on in the Capitol." Welcome to another edition of This Week In Hot Takes. This time, we’re looking at the hottest takes from March 29 to April 4. “If he gets with a real coach, a NBA coach, who can put him in an offense that’s designed to bring the defense to him and let him dish to offensive shooters. …Alvin [Gentry, the New Orleans Pelicans’ head coach] would be fine. Anybody besides Coach K!” Shannon Sharpe interjects with a “Don’t do that, Skip!” and Bayless continues with “Seriously, what Gilbert [Arenas, the former NBA player whose criticisms of Williamson started this] is talking about, does he know how to come down inbounds? He just doesn’t because he wasn’t TAUGHT! That’s highly teachable at the next level!” This then goes to the part quoted in the tweet above. On one level, there’s the semblance of a point here; different coaches favor different offensive schemes, and many of those work better for some players and not for others. Williamson is also 18, and it wouldn’t be all that surprising if he continues to learn and develop under whoever his next coach is, in conjunction with whichever assistants wind up focusing on him. And maybe Krzyzewski isn’t the world’s greatest Xs and Os coach, and maybe the offensive styles he likes to run weren’t perfect for Williamson (although Williamson’s averages of 22.6 points and 8.9 rebounds per game this year suggest he did pretty well in Krzyzewski’s systems). But it’s the “real coach” here that’s particularly ridiculous; Krzyzewski has five NCAA titles and a 1,132–344 record as a college head coach (1,059–285 at Duke), plus three Olympic gold medals as the head coach of the U.S. team, and he’s in both the Basketball Hall of Fame (inducted in 2001) and the College Basketball Hall of Fame (inducted in 2006). Suggesting he’s not a “real coach” is pretty silly. Even worse, Kentucky coach John Calipari shamelessly used UCLA to the point of embarrassment again on Monday, taking the school’s interest and reported contract offer and flipping it into a so-called ‘lifetime’ contract. Calipari’s bruised ego was needing a boost after again losing in the NCAA tournament to a team with inferior talent, so he exploited and re-exploited UCLA’s interest as a double-shot of leverage to fuel both his self-worth and bank account. Wooden had the Pyramid of Success. Calipari now can afford to build a pyramid. In a hat tip to his narcissism, Calipari forced Big Blue Nation to bow at his feet – apparently forever – as he again squeezed its bank account. A good Final Four bar debate: Who looks worse? Calipari for blatantly using UCLA and perpetuating his reputation as college athletics’ most overt mercenary? Or UCLA for being unsophisticated enough to wait all this time for an inevitable outcome only it couldn’t see? It leaves UCLA athletic director Dan Guerrero doing the administrative walk of shame this morning, with über-booster Casey Wasserman and Warriors general manager Bob Myers, a consultant to the search, flanking him as the wingmen. The hyperbole there feels like a bit much. There doesn’t seem to be anything to indicate that Calipari started the talks with UCLA, or that their pursuit of him wasn’t real; as he said on his coach’s show after signing this extension, “It has nothing to do with the other stuff…people call every year. They presented it to me and I appreciate it.” And it does seem likely that people do call Calipari regularly to offer him new jobs, and if that motivates his current school to try harder to keep him, that’s understandable. There isn’t much proving Calipari “exploited and re-exploited UCLA’s interest” or “shamelessly used UCLA to the point of embarrassment”; they chased him and made an offer and Kentucky made him a better offer to stay. And that’s before we get to a poorly-chosen “administrative walk of shame” metaphor. Home runs do not kill rallies. There is absolutely no evidence whatsoever, none, that suggests they do kill rallies, and there is detailed and more or less irrefutable mathematical evidence that says they don’t. …The other day, Mike Schmidt — not for the first time and I’m guessing not for the last — made the suggest that home runs kill rallies. It’s a funny point for Mike Schmidt to make considering that he’s in the Hall of Fame in part because he led the league in home runs eight times and hit 548 in his career. — This year, with zero outs and nobody on you expect teams to score .552 runs. After a solo home run with nobody out, teams score .553 runs the rest of the inning. — With one out and nobody on, you expect teams to score .309 runs the rest of the inning. After a solo home run with one out, teams score .301 runs the rest of the inning. — With two outs and nobody on, you expect teams to score .103 runs the rest of the inning. After a solo home run with two outs, teams score .133 runs the rest of the inning. Same … same. Home runs do not kill rallies. They do nothing to rallies. They just put runs on the board. That’s all. A hitters job is to help his team score the most runs, and the best way he can do this is by hitting a home run. Then the next guy comes up. That home run neither helps nor hurts the batters coming up. But Schmidt is still spouting this line, and that’s quite a hot take. Contract: 13 years, $330 million. Matt Joyce, pullled out of dumpster, 1-1, 2-run homer. Contract: 1 year, $1.25 million. So far this season, Harper is now hitting .500/.652/1.188, with a staggering OPS of 1.840. Joyce is hitting .250/.250/1.000 (with the high slugging percentage coming thanks to that one home run, his only hit of the season in four plate appearances so far). And both of those are small sample sizes too, to be sure, but it seems pretty likely that Harper is going to outperform Joyce this year. “Analytics: Braves win” indeed. Thanks for reading! Tune in next week for more This Week In Hot Takes. As always, you can send submissions to me via e-mail or on Twitter.